The downing... Last year the honey locust in our back yard was looking pretty bad, sick with something. We were quite sad about that, as that tree was a favorite. This spring it was clearly dead – we waited and hoped that some leaves would pop out, but there wasn't a one. Less than 50' away is an identical honey locust, planted at the same time (around 15 years ago), and it is doing just fine. We really don't know what killed the one in the back yard, though we suspect girdling by lawnmower. 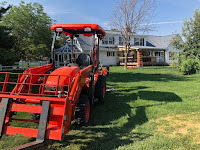 Anyway, we finally decided it was time for this thing to come down, so on Thursday I set up my tractor with a 1" nylon rope to put some constant tension on it, so that it would come down away from the house. The photo at right (click to embiggen) shows this setup. The nylon rope is fairly “stretchy”, which is great in this application. I could easily position the tractor to put something like 500 pounds of “pull” on the rope – plenty to ensure that when I sawed the tree off low on the trunk, it would fall at least roughly toward the tractor. By the time the tree fell enough to release the tension on the rope, it would be headed down in the direction I wanted it to go. This is far better than trying the same thing with something that didn't stretch at all, such as a chain. 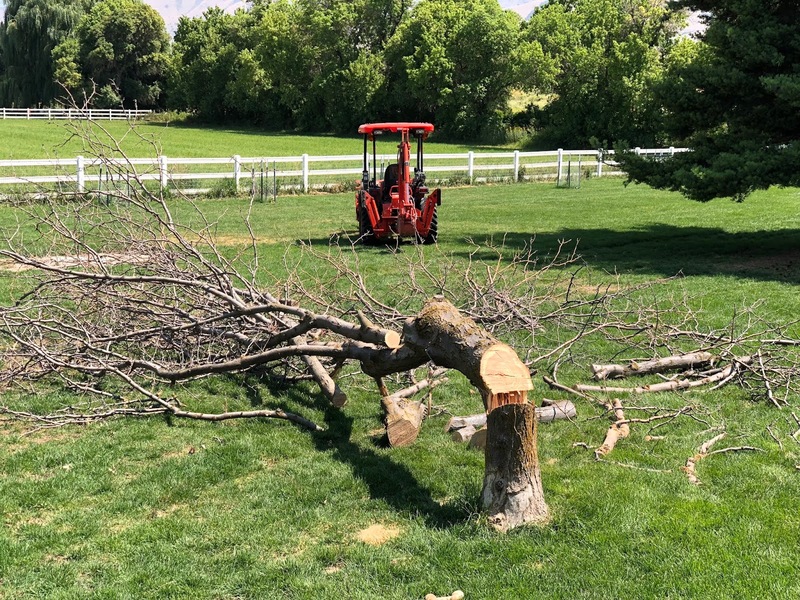 That sort of connection would release the tension as soon as the tree moved even one inch – and then I wouldn't know what direction it was coming down at all.